We love spring – the days are getting longer, the sun is peeping through the clouds and for many of us, it’s time for a spring clean. We’re probably looking to breathe some fresh air into our homes too – literally and metaphorically. So we’ve been taking a look at some of the influences that will be around this spring and summer to give you some ideas for the new season – from pretty floral designs to quirky accessories. Here are some of our favourites. Classic oriental prints evoke the very essence of Japan. Inspired by nature, with floral designs, muted, natural colours and organic textures, they’re tranquil and calming – perfect for the spring. Incorporate one or two oriental influences in your home for a really fresh and contemporary look – a modern interpretation of a timeless and elegant look. a. 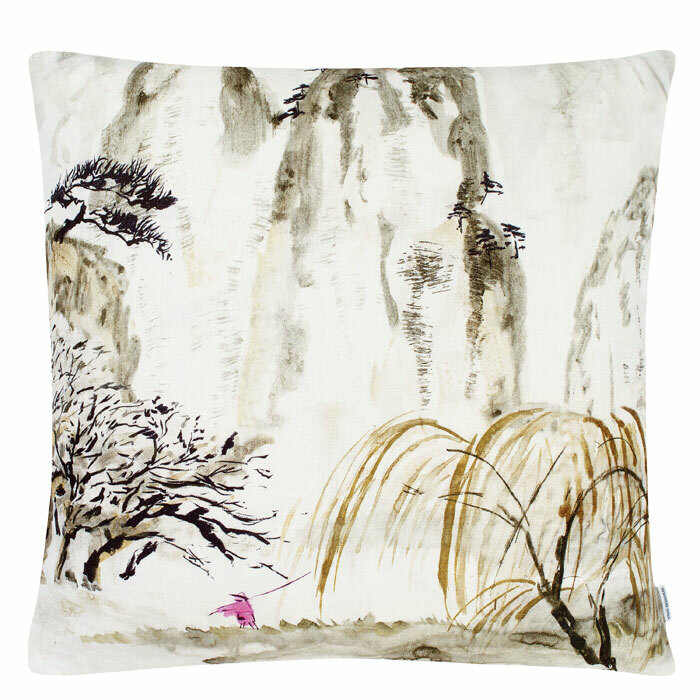 This beautiful cushion by Designers Guild, with its mountainous landscape, is inspired by classic oriental designs, and a work of art in its own right. The scene has been digitally printed onto a raw linen to retain the precision of the hand painted original. 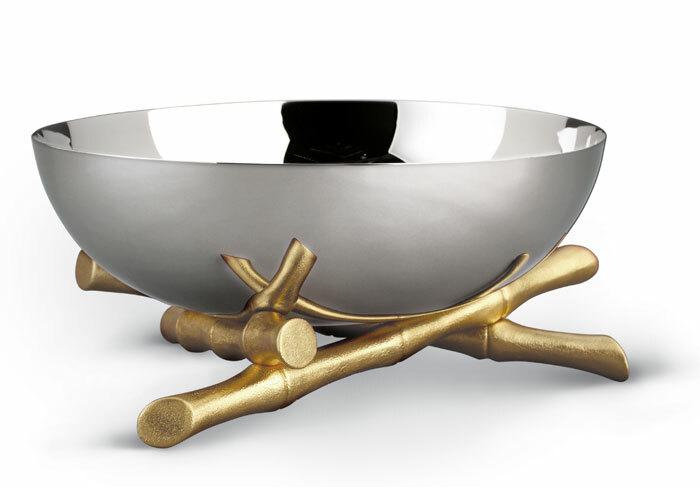 b. Transform your dining table with L’OBJET’s stunning, bamboo design bowl. The simple, clean aesthetic of this stainless steel piece is, of course, practical, but with the addition of the gold-plated bamboo, it is transformed into a real statement piece too. The traditional, organic detailing gives an otherwise modern piece a classic feel that will never be out of fashion. Spring is all about rebirth. After the dark days of winter, fresh, green shoots break through frozen earth, the fields and hedgerows are full of new life and there is a vitality and positivity to the world again. And what better symbol of rebirth than the beautiful butterfly? a. 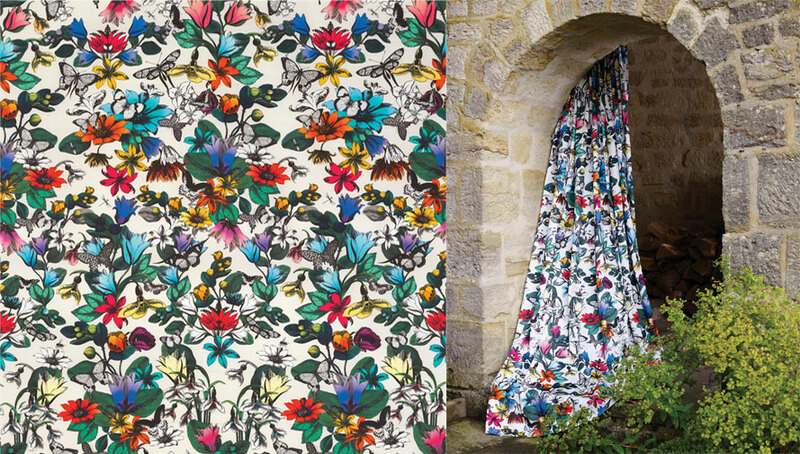 This stunning butterfly print fabric by Osborne and Little is a fabulous way of adding an element of fun to your home. 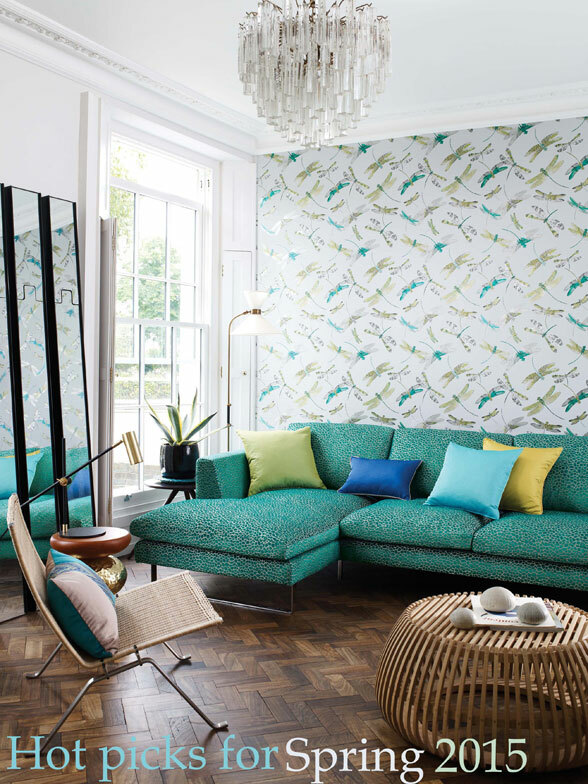 It can be teamed with earthy neutrals for a more sedate scheme but works wonderfully with warming red-orange and bright blue-green tones for a funkier look. b. 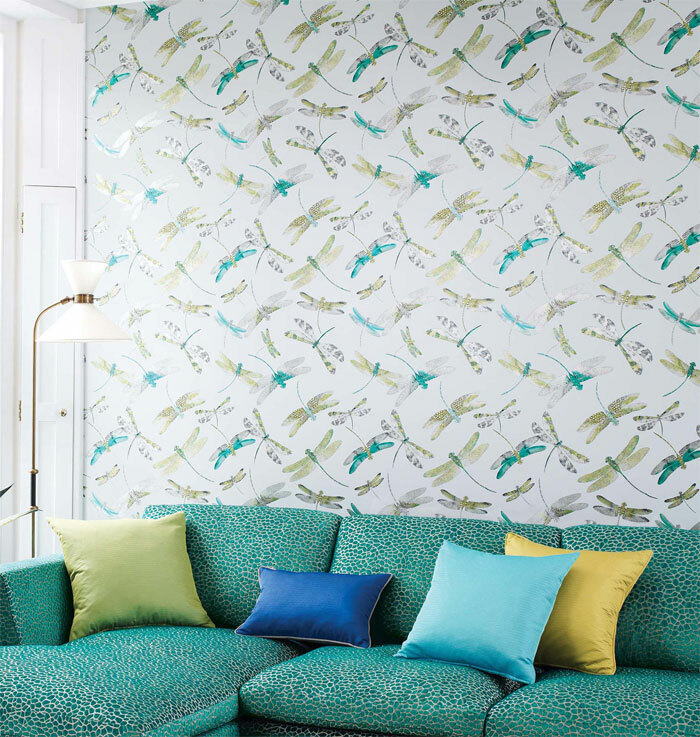 First seen in Matthew Williamson’s SS97 runway collection, the dragonfly emblem is a signature feature of the SS15 home collection. The fresh spring tones of this paper designed by Osborne & Little have been combined with a metallic shimmer finish to make the accent colours really pop. Now spring is here, it will soon be summer. And for us summer means festivals. While of course there is every chance that wellies and mud-caked jeans will be the order of the day, we prefer to think that festivals are all about vibrant colour and chic, relaxed style. And you can bring all the fun of the festivals into your own home with some of the beautiful, jewel coloured soft furnishings around at the moment. Think dazzling tropical blooms, towering palm trees and wild gardens. a. 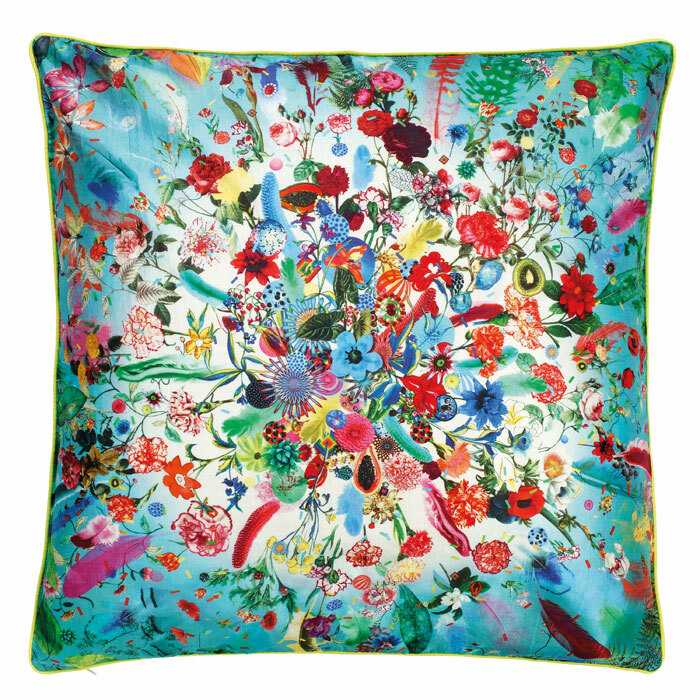 An eclectic mix of some of the key elements found in the latest Christian Lacroix collection at Designers Guild – feathers, florals and fruits, are bursting from this amazing silk cushion. There’s even a funky tiger print on the reverse for when you really want to embrace your wild side! b. Imagine yourself lying on a deserted beach on your exotic island hideaway when you tuck in to your summer salads with these gorgeous salad servers by Oliver Bonas, topped with gold pineapples. They’ll bring a retro-cool vibe to an already fashionable trend while adding a quirky twist to your tableware collection.